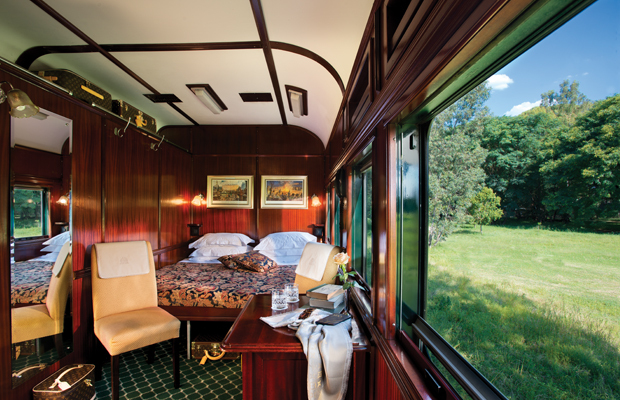 The most luxurious train in the world. Those looking to discover Africa can recapture the romance and atmosphere of a bygone era as you step aboard the reconditioned wood-panelled coaches and enjoy fine cuisine in five star luxury, all while passing through wildlife reserves and viewing the scenic landscapes Africa has to offer. 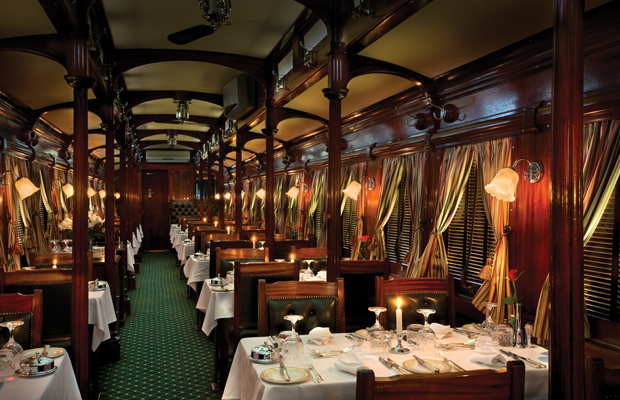 Bespoke train safaris for charter, private function, corporate tours, incentives, launches and events in the comfort of Rovos Rail’s top-quality service can also be arranged for those extra special occasions. Journeys vary from 3 days to the longest and most spectacular journey being 15 days! 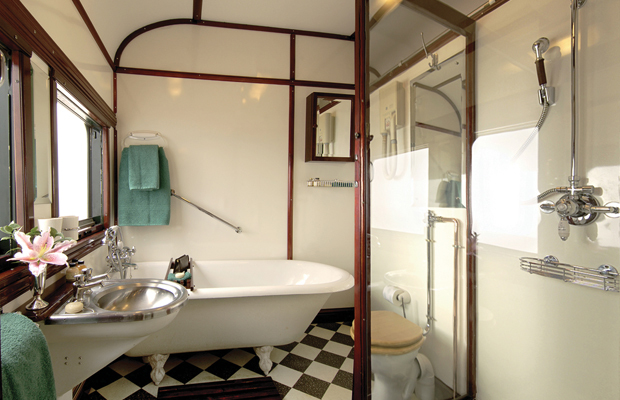 through Warmbaths, so named for its mineral waters, and Nylstroom, christened by the Voortrekkers as the source of the Nile River as the town’s river happened to be north flowing. The train then passes the edge of the escarpment and crosses the Tropic of Capricorn en route to the border with Zimbabwe. After formalities at Beitbridge the next morning, the train travels on the BBR line to Bulawayo, second city of Zimbabwe, capital of Matabeleland and industrial capital of the country. The following day sees the train travelling along one of the world’s longest stretches of straight railway line – 114 kilometres – before traversing Hwange National Park, a rich and diverse wildlife sanctuary where animals can be spotted from the train and a game drive excursion is enjoyed. After a service stop at Thompsons Junction, the sojourn ends at the incomparable Victoria Falls on the mighty Zambezi River. The surrounding areas offer travellers many recreational opportunities including cruises, whitewater rafting as well as superb game viewing and photo safaris. 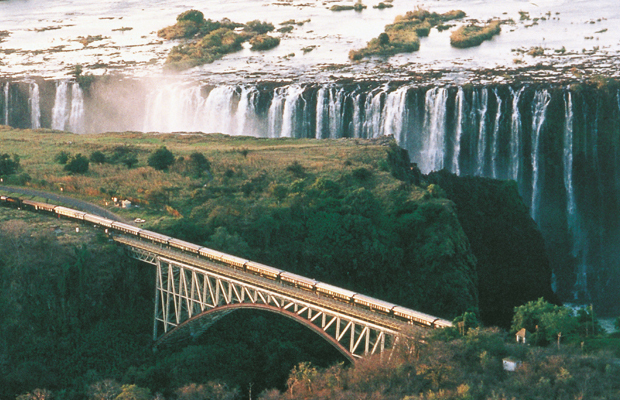 This epic 15-day train journey travels through South Africa, Botswana, Zimbabwe, Zambia and Tanzania and is one of the most famous in the world. The sojourn begins in Cape Town taking guests to the historic village of Matjiesfontein, the diamond town of Kimberley and the capital city of Pretoria for short tours followed by two nights in the Madikwe Game Reserve. Continue through Botswana into Zimbabwe where guests overnight at the Victoria Falls Hotel. After crossing the mighty Zambezi River, the train joins the Tazara line in Zambia and continues to Chisimba Falls where guests enjoy a bush walk. The train climbs to the Tanzanian border then descends into the Great Rift Valley negotiating the tunnels, switchbacks and viaducts of the spectacular escarpment. Climbing again, it traverses the Selous Game Reserve – the largest on the continent and a vision of timeless Africa – before the bustling arrival in Dar es Salaam the following day. 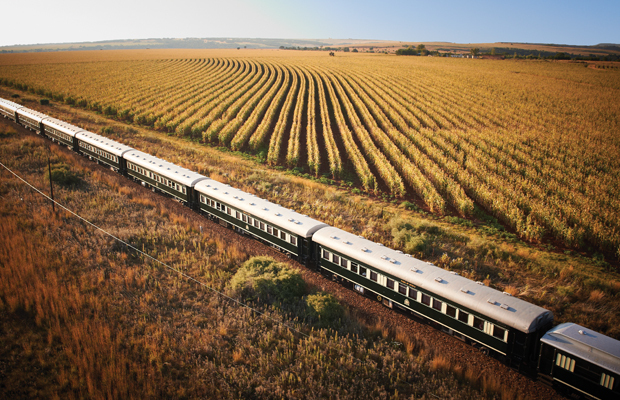 This nine-day 3 400-kilometre journey takes the train from the savannahs of the Highveld to the Atlantic in the west. Departing from Pretoria, the first stop is Kimberley, centre of one of the world’s famous diamond rushes where there is an opportunity to savour the 1870s atmosphere of the mine village. The train traverses the stark vistas of the Northern Cape to the Fish River Canyon – second in size to the Grand Canyon – and Garas Park with its Quiver Tree Forest and the Giant’s Playground. Guests continue across the untamed beauty of the Kalahari Desert to Namibia’s capital for a tour; Windhoek is a lively, cosmopolitan city with a strong German flavour. Then it’s a short flight to Sossusvlei, a stunning pan in the Namib Desert, for an overnight stay followed by a night in the game-rich Etosha National Park. On the last morning, the train travels the Namib to the perfectly preserved 19th-century German Hansa town of Swakopmund and Walvis Bay – an unforgettable end to a remarkable journey. Please don’t hesitate to contact us to request individual itineraries for these rail journeys. 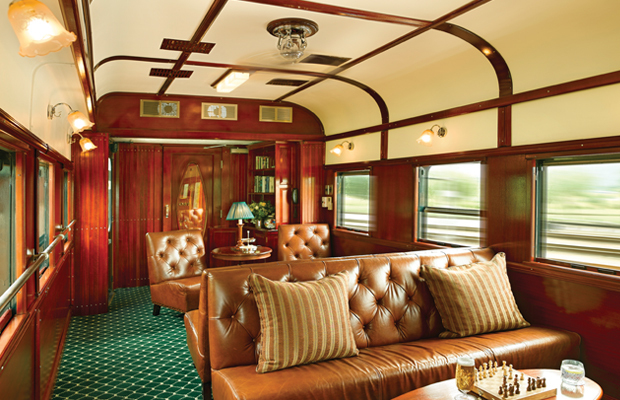 smoking lounge and Observation Car (32 guests) at the tail. guests’ every need is catered for. There’s an accent on fresh local ingredients and traditional dishes such as game are a specialty. Mobile Devices and Internet In maintaining the spirit of travel of a bygone era, there are no radios or television sets on board.